Jeff Morris, a friend from Down East Maine, believes that every toothy pickerel should come with a label on its side, a tag that says: Handle with Care. Another fishing friend, Lawrence Taylor of Arkansas, believes pickerel should be labeled “the stinkiest fish in freshwater.” Both are bass anglers, and every time a pickerel takes their bait, they complain as if the fish had tried to steal their wallet. I have a different view of the grass-green fish. Days when bass refuse to budge out of the weeds and the pickerel come on like gangbusters, I’m thankful for the action. Fact is, a couple pounds of pickerel busting a topwater bait is plenty entertaining. 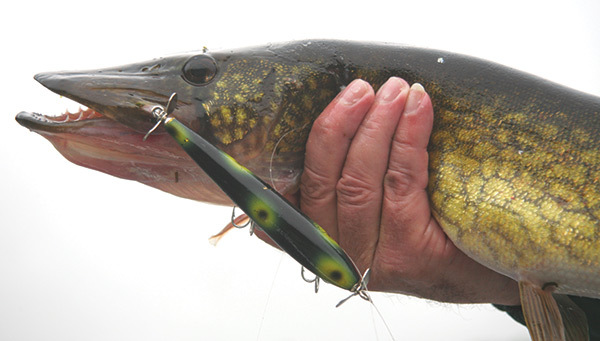 Topwaters make pickerel as much a surface show as a dogfight. Indeed, I do enjoy seeing that telltale torpedo wake as a pickerel rushes a topwater bait. I catch pickerel throughout New England, from Maine to New York; in the Mid-Atlantic, I net them from Pennsylvania south to Virginia, North and South Carolina. I catch them in Florida and Ohio, in the upper Mississippi River and Wisconsin. There’s also a strong contingent of pickerel in portions of Lake Michigan. Jeff and I were fishing the Androscoggin River upstream of Lisbon, Maine, one afternoon when topwater pickerel saved the day—at least my day. We were out for bass, but in the face of a cold front, the bass just were not biting. Prior to my arrival, Morris had been taking largemouth on shallow-running spinnerbaits, and that was how he approached the day’s outing. I had just driven down from the Penobscot River north of Bangor, where the smallmouth had gone ga-ga over my favorite traditional topwater, the wooden-body Smithwick Devil’s Horse. The Horse floats like a bar of soap, and propeller blades fore and aft churn the water like a skier. I still had one tied on a casting rod as I watched my friend fruitlessly work around the weeds with his spinnerbait. I was jigging with a different rod, and also doing poorly. A big wake rushed up behind Jeff’s spinnerbait, and a swirling circle formed just under the long blades and skirt. It might have been a nice bass; that’s what Jeff thought. But to a kid who grew up in Pennsylvania watching pickerel attack, something about the curl of the wake made me think a mouthful of needle teeth had missed the mark. I grabbed the rod with the Devil’s Horse and flung it several feet back of the swirl. I cannot say if it was or wasn’t the same fish; pickerel do hunt in loose packs. But another wake formed behind the hard bait, and this time a 4-pound pickerel didn’t miss the triple set of treble hooks hanging from the Horse. The fight was on. Through the course of a practically bassless late-spring day, aggressive pickerel continued to ride the pony. Each time I saw a similar situation—edge points off floating mats in 5 to 6 feet of water at least 10 yards offshore—I’d fling the Horse, and more often than not, at the very least I would get a follow. Depending on local conditions, May to early July is spawning season for pickerel in the North, and spawning makes them aggressive. While fishing for smallmouth bass on the Penobscot River, my host Lawrence Taylor decided we should take a day to fish Pushaw Lake, a beautiful impoundment north of Bangor. Perhaps it was the sunny day or the moon phase—even the loons stayed nested—but those bass just weren’t interested. We were working the dense surface weeds with bass baits, specifically Yum Money Frogs, a fast-kicking soft plastic that has been scoring high numbers of largemouth for me since its introduction several years ago. As we drifted into a narrow throat of open water, Taylor put his Frog “on the money” in a pocket of emerging stalks and crowning weeds. Instead of a bass erupting, I saw that telltale wake zip out from the weeds to engulf the frog. Taylor carefully led the fish to the boat, and his first look was pure disappointment. Pickerel was not his choice of fish for the day. But I sensed opportunity, tied on a frog of my own, and began making tight casts to the line of floating weeds and straight grass. It wasn’t long before a pickerel latched onto the bait. Unlike Taylor, I was all smiles. Over the course of two hours, soft frogs produced pickerel after pickerel for the three men in our boat. The Yum frog is not marketed for pickerel, but I doubt any other bait would have done so well. A frog skimming over the weeds with a kicking action proved perfect. Bait selection isn’t usually that critical with pickerel; they’re not that discriminating. I select baits more to match the conditions. Other weed and structure considerations lead to different baits. Unlike my upcoming day on the Androscoggin River, when the pickerel would be staging on grass points at the edges of open water, the pics on Pushaw were deep in the weeds. A bait with hanging treble hooks, like the Devil’s Horse, would have been impossible in that heavy cover—one twitch would have wrapped it in green slime. Lake Oneida in central New York also is known for excellent bass fishing in extensive weed beds. The stalks bend over and cover the surface some places, but here, mostly you work deeper grass that stops several feet short of the surface. Pockets and edge openings provide the prime places to fish. I was fishing the lake with bass pro Zell Roland, who had just finished an exhaustive tournament on the 21-mile impoundment. We spent the morning working the surface with buzzbaits and his signature Pop-R, and we put a licking on 3- and 4-pound smallmouths. Then the proverbial switch flipped, and the bass turned off. The first wake that rode up and over my buzzbait was a bit startling. When a pickerel busts the lightweight prop on a buzzbait, it can sound like a box of cheap jewelry rattling, and when the trajectory takes the fish clear out of the water, there’s no mistaking what’s on the line. Then, you hold the rod tip high and hope those sharp teeth don’t make it past the hook. If a buzzbait snags at the corner of a pickerel’s mouth, it’s usually bye-bye bait. I managed to get this 21-inch fish to the boat. Then I heard Zell sing out as a pic hit his buzzbait. In truth, we can only speculate as to why fish stop biting, but the sudden emergence of a host of large, active pickerel in a weed flat where the smallmouth had recently quit biting was no coincidence.When one moves in, the other usually moves out or just shuts down. Again, I wasn’t going to turn my nose up at the action, and neither did Zell. For a good hour we hounded the flats with buzzbaits, hooking the proverbial boatload of toothy fish. It was pure fun. Buzzbaits are prime topwaters for the straight grass stalks of Oneida. You don’t have to use expensive buzzbaits, either; anything that churns the surface at a moderate speed will do. But a soft-plastic trailer can be a fine addition, and a thick-bodied plastic with an action tail enhances the buoyancy of the buzzbait. It can be worked slow and still churn the surface. The right trailer, in this case a twin-forked grub or slender double-claw Yum Money Craw, calms the churn just enough to make a more appealing presentation. But, for me, the ultimate in topwaters for pickerel is a surface fly. This is when the fishing gets serious. With a 6-weight fly rod, I throw deer hair and synthetic poppers that drive pickerel crazy. A good example of this type of fly is the Dahlberg Rabbit Strip Diver. One weekend while fishing the Vermont side of Lake Champlain, around the Hero Islands, I concentrated on emerging stalk weeds in a wide bay. A short wire leader gave me confidence I could catch pickerel without losing the black/chartreuse Dahlbergs. To tease the fish, I stripped line in short, staccato bursts. After a brief pause, a hard strip pulled the fly under; then came softer pulls. Pickerel torpedoed those snaking Dahlbergs, and over two days I caught dozens of nice fish, including some 5-pounders. When I finally went looking for smallmouth bass, I didn’t feel any need to apologize to my boat mates for what had been a disruptive choice in tactics. I guess the pugnacious pickerel brings out the same attitude in me, too.